Our research aims to inform sustainable management approaches to atmospheric pollutants, through understanding the processes and interactions of global environmental contamination from a systems perspective. Specifically, we develop new tools to better understand and quantify the pathway by which emissions of toxic substances travel and transform in the atmosphere to impact humans and the environment away from sources. The ultimate goal of my work is to inform efforts to manage pollution. This research addresses fundamental scientific questions about the atmospheric behavior of contaminants, while addressing the engineering challenge of designing analytical tools to inform management strategies. 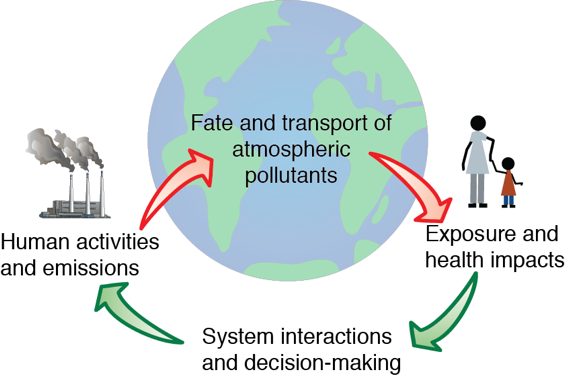 As shown in the figure below, our research addresses a conceptual system in which human activities create emissions, pollutants are then transported near and far, leading to human exposure and eventual health impacts. These human and environmental impacts lead to economic consequences and policy responses (including regulation) which can then modify emissions. Our research examines all of the aspects of this system. Specific research efforts are detailed below. Our work examines how persistent, toxic pollutants travel in the environment. Mercury and POPs are global environmental pollutants influenced by human activities. The dominant source of anthropogenic mercury emissions is burning of coal, but industrial processes such as metals production and intentional uses of mercury are also sources. POPs can be intentionally produced (for use as pesticides and industrial chemicals) or emitted as byproducts of combustion or other industrial processes. Both mercury and POPs accumulate in food webs, posing risks to human health and the environment. Despite increasing attention to mercury and POPs as environmental problems, there are significant outstanding scientific questions regarding their behavior and chemistry in the atmosphere and biosphere. Constraining the cycling between the atmosphere and land and ocean reservoirs, and the extent to which the legacy of past anthropogenic activities affect current pollution, are critical needs. From a policy perspective, a key objective is to quantify the extent to which domestic and international emissions influence present-day deposition (and thus ultimately human exposure), so that emissions reduction activities can be implemented effectively. In addition, we are interested in constraining potential future changes in exposure due to climate change. Using the GEOS-Chem global chemical transport model, we are examining the mercury cycle, using inverse modeling techniques to constrain sources, and informing efforts to measure and monitor atmospheric mercury. We participated in the 2013 Nitrogen, Oxidants, Mercury and Aerosol Distributions, Sources and Sinks (NOMADSS) campaign, and are conducting modeling for the Global Mercury Assessment. For POPs, we developed the first POPs model for GEOS-Chem, and used it to examine the fate and transport of PAHs to the Arctic and their gas-particle partitioning behavior. We have developed simulations for PCBs and PFOS/PFOA, and we are currently examining the production of PAH degradation products. We are also examining trans-Pacific and global transport of pollutants, and atmospheric response to policies on particulate matter and ozone. Our work in this area has been funded by the U.S. National Science Foundation's CAREER program, the Arctic System Science Program, and the Atmospheric Chemistry Program, and is part of the MIT Superfund Center. Research on global pollutant fate and transport, as described above, can identify sources of contamination. To address how this burden can contribute to human exposure and health, we link output of atmospheric models with health-relevant analysis. Our work in this area addresses both toxic, long-lived contaminants such as mercury and more traditional air pollutants such as ozone and particulate matter. For mercury, for example, we used the GEOS-Chem mercury simulation to drive ecosystem and ocean models, in order to identify the relative importance of present-day and historical sources to fish contamination (Selin et al., 2010). We found that while source contribution varied dramatically depending on ecosystem type, reducing U.S. contributions could bring exposure under health-relevant thresholds for some regions and ecosystems. Linking models of atmospheric chemistry and human impact requires attention to uncertainties. In a series of two papers (Thompson and Selin, 2012; Thompson et al., 2014), we set out a method for assessing appropriate atmospheric model resolution for analyzing the health impacts of policy proposals. In a feasibility study, we used the regional atmospheric model CAMx to evaluate policy interventions for ozone for Houston, Texas, in the context of their air pollution health impacts. We showed that, considering uncertainties in health impacts, fine-resolution (4 km square) modeling for O3 provided similar results to coarser-scale models at 12 km when assessing air pollution health impacts. Applying this method U.S.-wide, we found that at national scale, health benefits calculated at even coarser resolution (36 km) agree within errors with finer-scale modeling (4 km). Our work in this area has used a variety of models, including GEOS-Chem, ecosystem mercury models, CAMx, and BenMAP. Our funding has come from the U.S. Environmental Protection Agency, and the MIT Joint Program on the Science and Policy of Global Change. Informing policy responses to air pollution often requires cost-benefit and regulatory analysis, which is widely used in U.S. decision-making. We use integrated assessment and other techniques to quantify the economic impacts of future pollution. Using economic model components of the MIT Integrated Global System Model framework, coupled with full-scale atmospheric chemistry simulations, we quantified the health and economic impacts of future ozone pollution (Selin et al., 2009), and calculated the economic impacts of air pollution in Europe (Nam et al. 2010) and China (Matus et al., 2012). From a policy perspective, our work has also addressed the ways in which policy-makers use scientific information. We showed that policies to address mercury, for example, often fail to address issues that span long timescales (Selin, 2011), and that the new global mercury treaty (The Minamata Convention) will likely result in avoided emissions increases globally. A key element of effective research in this area, from an engineering perspective, involves identifying best practices in designing and managing system interventions, including multi-stakeholder decision-making. Funding for this work has been from the U.S. Environmental Protection Agency, the MIT Joint Program on the Science and Policy of Global Change, and the Center for Complex Engineering Systems. To close the loop illustrated in the figure above, we have developed new decision-relevant modeling tools based on integrated assessment approaches. We are using these tools to assess how climate policies (such as renewable fuel standards or cap-and-trade initiatives) can influence health-related economic damages from air pollution over the next several decades, and to examine how Minamata Convention provisions will affect U.S. impacts of mercury over time. We are also conducting uncertainty and sensitivity analyses using this framework, developing new approaches. In related work, we are examining how uncertainties in climate combine with uncertainties in emissions to affect U.S. ozone and particulate matter health impacts. Funding for this work comes from the U.S. Environmental Protection Agency, the MIT Joint Program on the Science and Policy of Global Change, and the U.S. National Science Foundation Coupled Natural and Human Systems Program.